21st Century Music are playlists and write-ups that focus on artists that have released their music since 2000. These highlight new(er) acts that continue the sound and spirit of the older acts that are highlighted on Ceremony. Click on the streaming service of your choice below to listen to the playlist as you read along. The past twenty years has seen a new breed of synth-pop bands that draw inspiration directly from the early sounds of the genre – yes, the ‘80s music that inspires much of the content of Ceremony. One of those acts has been Craft Spells, which revolves around Stockton, California native Justin Vallesteros. He has recorded on Indie Label Captured Tracks (and is comparable to label-mates, Wild Nothing), releasing two albums and an EP over the past eight years. There have only been two unremarkable singles released over the past four years since the last album, so I’m not sure the state of things these days and whether more music can be expected. The word that comes to mind most when listening to Craft Spells is “pleasant.” All the songs are mid to low-tempo and have lovely, non-aggressive melodies and smartly crafted synth and guitar combinations. 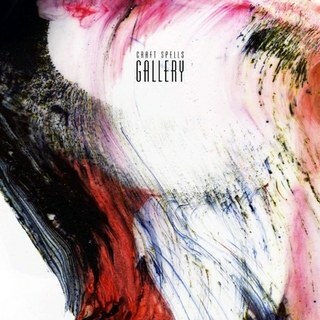 Reviews have compared them to my beloved New Order, and while there are some similarities in the guitar work, Craft Spells songs are too light (in sound and mood) and lacking in beat to warrant a full New Order comparison. But in modern music it’s always a pleasure to hear solid melodies and to discover a band that produces consistently good music. And while Craft Spells’ sound is a little too consistent over the three releases – a little more variety wouldn't hurt their cause – the delivery of one solid song after another makes them a rare 21st century band worth listening to the entire albums. Idle Labor was stronger than Nausea, but both offer many delightful moments and a solid groove of synth-pop and new wave infused enjoyment. The impossibly young looking Justin Vallesteros. “Party Talk” was the first single released prior to the first album, the standout track on the second album was “Breaking the Angle Against the Tide.” For those who grew up in the ‘80s and are looking for a modern take on the sound they grew up with, Craft Spells is a good choice in which to dive in.